Make yourself at home in one of the 85 guestrooms featuring minibars. Rooms have private balconies. Digital television is provided for your entertainment. Private bathrooms with bathtubs or showers feature bidets and hair dryers. Enjoy a meal at the restaurant, or stay in and take advantage of the hotel's room service (during limited hours). Wrap up your day with a drink at the bar/lounge. A complimentary buffet breakfast is served daily from 8 AM to 10 AM. Stay in one of 30 guestrooms featuring flat-screen televisions. Complimentary wireless Internet access keeps you connected, and satellite programming is available for your entertainment. Private bathrooms with bathtubs or showers feature complimentary toiletries and bidets. Conveniences include phones and desks, and housekeeping is provided daily. 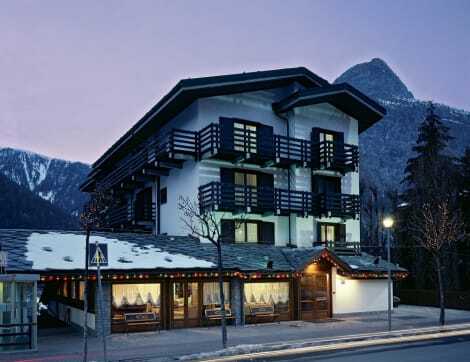 When you stay at Hotel Cresta et Duc in Courmayeur, you'll be near ski lifts, a 2-minute drive from Courmayeur Cable Car and 9 minutes from Pre-Saint-Didier Spa. 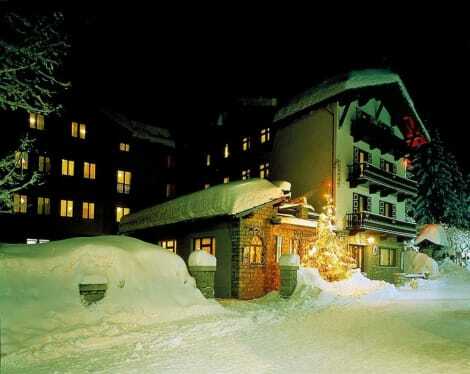 This 4-star hotel is 6.4 mi (10.3 km) from Mont Blanc and 2.4 mi (3.9 km) from Mont Blanc Cable Car. Offering a peaceful location and an extra-large garden with tables and chairs, Chalet Plan Gorret is just outside Courmayeur. The property is connected by bus to ski lifts and, during summer, to the city centre, 1.5 km away. Rooms at the Chalet all feature wood floors and panoramic views of the surrounding mountains or the woods. They also have tea and coffee-making facilities and an LCD TV with satellite channels. Plan Gorret's restaurant serves traditional Italian cuisine and is open daily at dinner. The rustic-style hotel also features a sun terrace with deckchairs. The Courmayeur ski slopes on Mount Blanc are easily reached via a cable car from the town centre. Enjoy a meal at the restaurant or snacks in the coffee shop/café. The hotel also offers room service (during limited hours). Quench your thirst with your favorite drink at the bar/lounge. Buffet breakfasts are available daily from 8:00 AM to 10:30 AM for a fee. Featured amenities include multilingual staff, luggage storage, and coffee/tea in a common area. Free self parking is available onsite. Hotel Triolet offers a garden and terrace with views of Mont Blanc. The cable car to the Courmayeur ski slopes is 100 metres away. WiFi is free throughout. All rooms at the Triolet Hotel feature a TV and a private bathroom. Most include a balcony. There are also a cosy reading roomand a bar. A small conference room is also available. A continental and cooked breakfast buffet is served each morning and BBQs are organised in the garden in warm weather. The Triolet is a 5-minute walk from the centre of Courmayeur and is easily reached from the A5 motorway. Guests can enjoy the wellness centre located next to the property, as well as discounts at thermal spas in Pré-Saint-Didier, 2 km away. 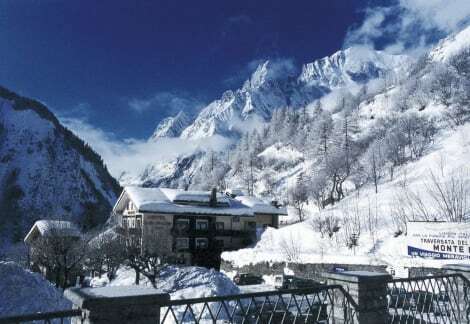 The Italian ski resort of Courmayeur sits at the base of Mont Blanc in the Aosta Valley. It tends to attract skiers all year round, and the picturesque snow-capped scenery is just as big a draw as the slopes. 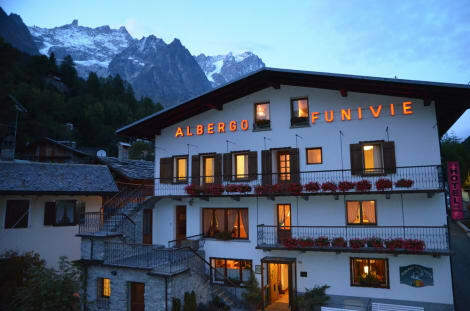 Courmayeur is also less than two hours from both Geneva and Turin by car. 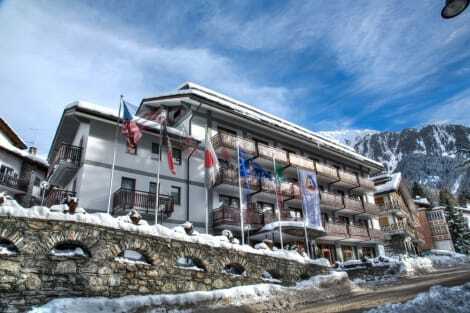 You can find budget, mid-range and luxury Courmayeur hotels, making the resort that bit more inclusive than other ski destinations. Many people pick Courmayeur for the fresh, crisp mountain air. It's popular with international tourists – it's claimed more languages are spoken here than at the UN. Even so, Courmayeur doesn't feel as crowded as other ski resorts. There are different areas of the resort suited to varied ability levels. Advanced skiers and snowboarders should head to the Mont Blanc side of town. The resort shares the Vallee Blanche glacial ski route with Chamonix. You can use your lift pass from Courmayeur to access this side of the Chamonix resort and the Argentière section. The centre of the resort is vehicle-free, giving you the freedom to wander around and take in Courmayeur's charms. When the sky is clearest, you can see as many as 14 mountain peaks in the surrounding area. Cobbled streets and ancient chapels lend Cormayeur a more traditional atmosphere. It was originally founded as a spa town in the 17th century. The ‘hidden side' of the resort is Little Courmayeur, made up of the smaller villages dotted around. In summer, you can walk or hike some of the trails around Mont Blanc. There are also chances to try rock climbing, mountain biking and paragliding. Courmayeur enjoys a strong reputation for its après-ski dining, and the restaurant choices are quite varied. Stylish bars and clubs also give the area's nightlife a classy ambience. The Petit Royal restaurant inside the Hotel Royal e Golf has been awarded a Michelin star for its food. An advance booking is essential, as the restaurant only seats 24.